Ready to Learn How @liveconx Can Help Your Business? It is not a product, it is not software, it does not burden your IT support resources or require hours of training — @liveconx is a service. A service that effciently allows you to meet and exceed your customer needs and expectations, while helping you reduce your costs. Our FREE Fact Sheet will give your business the industry insight and knowledge necessary to succeed. Whether your customers are rental tenants with service issues, homecare patients with complex medical inquiries, or any type of high-value service client needing 24/7 access to customer care, if your organization isn't designed to respond around-the-clock to customers' calls, you're likely failing to meet customer expectations. 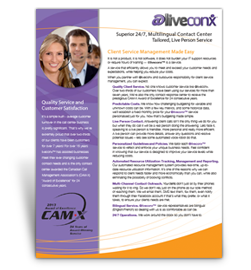 Complete the form to the right to learn how @liveconx can help you meet customer needs and save costs without sacrificing quality.